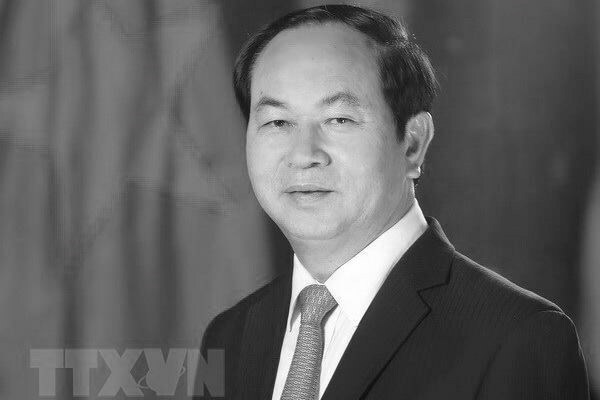 President of the Socialist Republic of Vietnam comrade Tran Dai Quang was born on October 12, 1956, in Quang Thien commune, Kim Son district, Ninh Binh province; residence at No. 8, Nguy Nhu Kon Tum street, Nhan Chinh Ward, Thanh Xuan district, Hanoi city. He was admitted to the Communist Party of Vietnam on July 26, 1980.July 1972 – October 1975: He was a student at the People’s Police School and School of Foreign Languages under the Ministry of the Interior (now the Ministry of Public Security).October 1975 – June 1990: Officer, Deputy Head and Head of Section at the Political Protection Department under the Ministry of the Interior.June 1990 – September 1996: Deputy Secretary of the Party Committee and Deputy Head and Deputy Head in charge of Security Staff Department, General Department of Security.September 1996 – October 2000: Member of the standing board of the Party Committee of the General Security Department; and Secretary of the Party Committee and Head of the Security Staff Department.October 2000 – April 2006: Deputy Secretary of Party Committee and Deputy Head of the General Security Department, Ministry of Public Security. He was promoted to Major General and conferred with the title of Associate Professor in 2003.April 2006 – January 2011: Member of standing board of the Central Public Security Party Committee, and Deputy Minister of Public Security; promoted to Lieutenant General in April 2007 and conferred with the title of Professor in 2009. At the 10th Party Congress, he was elected to the Party Central Committee.January 2011 – July 2011: Member of the standing board of the Central Public Security Party Committee, and Deputy Minister of Public Security. At the 11th Party Congress, he was elected to the Party Central Committee, and elected by the Party Central Committee to the Political Bureau; Member of the National Assembly, the 13th tenure.July 2011 – December 2012: Politburo Member, Secretary of the Central Public Security Party Committee, Minister of Public Security. He was promoted to Senior Lieutenant General in December 2011; Head of the Central Highlands Steering Committee.December 2012 – April 2016: Politburo Member, Secretary of the Central Public Security Party Committee, Minister of Public Security. He was promoted to General in December 2012; Deputy Head of the Central Steering Committee on Anti-Corruption, Deputy Head of the central internal political protection sub-committee. At the 12the Party Congress, he was re-elected to the Party Central Committee, and elected by the Party Central Committee to the Political Bureau in January 2016. At the 11th session of the National Assembly, the 13th tenure, he was elected President of the Socialist Republic of Vietnam in April 2016. At the first session of the National Assembly, the 14th tenure, he was re-elected President of the Socialist Republic of Vietnam in July 2016.From April 2016 to now: Politburo Member, President of the State, Chairman of the National Defence and Security Council; Member of the standing board of the Central Military Party Committee; Member of the standing board of the Central Public Security Party Committee; Member of the National Assembly, the 14th tenure; Head of the Central Judicial Reform Steering Committee.He was Member of the Party Central Committee of the 10th, 11th and 12th tenures; Politburo Member of the 11th and 12th tenure; Member of National Assembly of the 13th and 14th tenures.He has been awarded many noble orders and medals and insignia of 30 years of Party membership by the Party and State in recognition of his various contributions to the revolutionary cause of the Party and the nation.